The hour of decision is at hand. The hour for all men of all nations to turn to me with their whole heart. The hour to ask for My salvation, My wisdom, My knowledge, My understanding, My mercy, My peace, My love, and My justice…For only in Me will you find healing, deliverance and restoration for your soul and for your nations. For each one who will seek me with their whole heart, I will impart My nature. For each one who will repent with their whole heart, I will lift them up to heavenly places with My Son. For those who will count their life as nothing, I will cause them to gain my power and authority. My anointing will come forth in those who have been humbled by me. No weapon that is formed against Me shall prosper, and no weapon that is formed against My Own shall prosper! No one can stand against my plan for the coming kingdom of My Son! Only those who have allowed me to cleanse them and impart myself to them will stand in joy and victory. They are the ones who will be waiting patiently for my return…They are the ones who praise me. Can two walk together except they be agreed? No, they cannot! And unless men and women of all nations come to Me, there will be no peace. Only in Me is there peace. I have heard the cries of the oppressed of all nations and I have arisen on their behalf. I will not withdraw my hand until justice is accomplished. The religious confusion that has grown strong throughout the world has caused many to fall. My message is simple: I Am is love. Do unto others as you would have others do unto you. Love is gracious, patient and kind, and it is not rude or proud. Love does no wrong to its neighbor regardless of their color, race, or religion. I have not changed, nor will I change…So it is My people who must change and be conformed into My image and character. I will have a holy people! The whole earth groans in the pain of birth. The birthing of My own. The birthing of My delight and My pleasure. The birthing of My will and My plan for the earth. The birthing of the day of the Lord. The day of the return of the Messiah to gather His own unto Himself for eternity. It is a day to look up! A day to rejoice, for your King is returning in His glory– the glory of the Everlasting One! Then Jesus declared, “I am the bread of life. He who comes to Me will never go hungry, and he who believes in Me will never be thirsty. But as I told you, you have seen Me and still you do not believe. All that the Father gives me will come to Me, and whoever comes to Me, I will never drive away. For I have come down from Heaven not to do My will but to do the will of Him who sent Me, and I shall lose none of all that He has given Me, but WILL RAISE THEM UP IN THE LAST DAY. For My Father’s will is that everyone who looks to the Son and believes in Him shall have eternal life, and I will RAISE HIM UP AT THE LAST DAY” (John 6:35-40). Beloved, speak to My people. Tell them of My love for them. Tell them of My yearning to be totally with them. Tell them for Me. Speak for Me…For many who say they are Mine cannot hear My voice. Was My agony on the cross not enough for you, My people? Was My blood not perfect enough to make atonement for you? Did My beating with the whip not heal you? Was My resurrection not enough to set you free? Must you continue to trample underfoot My sacrifice on the cross? Where is the love and harmony between My people? Where is the tenderness and fellowship of the cross? Where is the Mind of Christ that is available to every Christian? Have you no kingdom within you? The love of the Father sent Me to you. The love within Me caused Me to obey the desire of Our Father. It was because of love that I went to the cross to bring forth your redemption with My blood. It was because of Love that I have forgiven all your sins. It was because of love that I made available resurrection life to all who come to me. Ask them to receive My redemption and new life and be healed! Tell them of the incredible riches that are their inheritance from Me as they abide in Me. Tell them that I will withhold nothing from those who walk with an upright heart. Tell them that I reward those who seek me and that a crown of life is stored up for all those who will walk completely into their inheritance in Me. They will suffer persecution for their godliness because the world hates My Holiness, but My life in them will keep them from turning back to the filth of the world. Evil is increasing in the final hour, but My love for all men remains constant. My creative power, My authority, and My wisdom is available to those who will come and eat from my hand. I yearn to hear the voices of My own–voices raised in harmony and love–voices that will sing the high praises of Our Father. Sing forth My people! Let Me hear your voice! Even as you desire to hear My voice, so I desire to hear yours! Sing, shout, make a joyful noise and I will hear you and I will respond with my own rejoicing over you! Is there one among you that will believe My love for you? Is there one among you that will believe that I am who I said I am–and that I would not lie or deceive you? Is there one who desires to be recreated in My likeness? To be as Me you must spend time with Me. You must desire to be with Me more than you desire to be with the world. 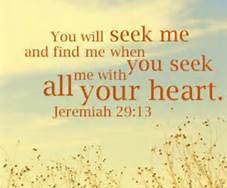 If you seek Me you will find Me if you seek Me with your whole heart! Rejoice in Me! Sing praises to Me and unto those who do not know My name! Let Me break forth from within you, to bless a dying world. My Father will love those who have loved Me. The Holy Spirit will teach those who desire to know Me as the “I Am” instead of as you “think” I am. Let My people praise Me and render unto My Father the holy praises of a holy people. Sharon Hansen along with her husband reside in Raytown, Missouri, U.S.A. Sharon founded the ministry of Jesus Christ International and has had an extensive outreach to South Africa. Her love of God and her outreach to the poor make her a lovely handmaiden of the Lord. She has a heart for all people to come to the knowledge of Christ as savior and her anointed preaching and prophetic words are used of God to bless many. Betty Miller and Sharon Hansen were roommates and co-workers in the seventies, when they made a missionary journey to India. Sharon still has that missionary heart and has blessed many through her ministry.